After I finished two marathons in the month of March (Napa Valley and Oakland) I thought what would be my next logical challenge? Somehow, not exactly sure how, the thought of running 6 extra miles to make the magical 'ultra' millage just wouldn't leave my mind. Knowing the difference between a road and trail race I consulted an experienced trail ultra runner named 'Ken' from Running Stupid regarding running a trail marathon and which race would be appropriate for a newbie. I actually volunteered at an Inside Trail Racing (ITR) 50K race at Lake Chabot and got a first hand view of all the 50K'ers, got to hear about all the races they've been in, equipment they used and tips/tricks used to help complete the race per their desired pace/time. After the race as we were cleaning up the finishers table, cooking that last pot of vegetarian and beef noodle soup, I decided on the Lake Folsom 50K towards the end of April because the race _only_ had 2,850ft of total elevation change over 31 miles. Elevation change is obviously a major indicator of how challenging a course is and there are other factors! 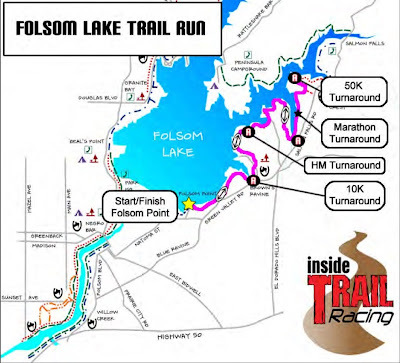 The race started out at Folsom Point at 8AM in the morning and the air was crisp, clean and cool as you'd expect at a lake. The start area was a bit crowded and parking was available but you had to find it hidden in the twists and turns of the area. There were two bathrooms and no toilet paper but hey we're trail runners and that is all extra when there are plenty of trees and bushes around. Here's the motley bunch of marathon and ultra runners ready to attack the hills. There was no line per se just runners waiting for Tim/Ken to yell 'go!'. Ken doing his 'thang' getting everyone pumped up and ready to "Run All Day!" Later at the turn around some 15.5 miles away Ken would refill my water bottle, add my Cytomax and the magical, critical ingredient called ICE that enabled me to make it back in the heat - but I get ahead of myself. The race starts out with a slight grade up and out and over a dam then slowly transitions you into the single track trail. You pretty much follow the lake shore line but sometimes you go inland and other times you come right up to the lake. This picture hints at the beautiful wild flowers that were out in April but don't come close to showing all the layers of colors : Purple, Red, Yellow, White and Blue. I finished the first half in 3 hours which was right on my estimated 6 hour finish and I was very happy. However, we started in cool morning air and by the time I hit the turn around point it had become noon and the temperature was 85+ deg F!! Not good. Ken refilled my water bottle, added my Cytomax and had ICE! I took a few minutes off to take my shoes off because I had begun to sweat and had several 'hot spots' on my heal. Sure enough I had a blister on the outside of my heal but it didn't hurt too much. Knowing what I know now, I should have lanced and taped it then. I also should have brought an extra pair of socks, a knife and some 'moleskin' to protect the blister area hot spot! On the way back after the half way point, I had to stop at one of the aide stations because I couldn't tolerate the pain from the heal blisters. Once I took my sock off I knew I was in trouble given how big the blister was. Luckily for me one of the AS volunteers had a pocket knife and I lanced and drained out the blister. Then, just added napkins around to protect and help drain. More ice, water, some M&Ms and I was back on the trail. But, my pace was getting slower and slower. Also at hour 4 my iPhone 5 ran out of battery and I forgot my Garmin GPS watch in the car! So, I have no record of the race at all. I did the first half in 3 hours and thought for sure I'd finish in about 6 hours. By mile ~22 I was done. My feet were blistered, my legs felt heavy and I was sweating profusely in the hot weather. My ice had melted and the next AS was miles away. I stopped numerous times, but some how kept going. I finally finished in 7:55 - 5 minutes before the cut off time! I sort of remember finally crossing the finish line. There were still volunteers and a few diehard runners still hanging around to see who finished and who didn't. I made it to a tree and just collapsed. An angel of an volunteer took one look at me and asked what she could bring me in addition to finishers beer stein and shirt. I nearly cried with relief and appreciation. I asked for a cold beer, a cold coke and some soup in that order. I also happened to qualify on that day for Marathon Maniacs. However, at the time all I wanted was to lay in the grass, sip my cold beer and do absolutely nothing but feel the cool air coming off the lake. It was the challenge and adventure I expected plus more. Next time I'll bring a knife, extra socks, moleskin and better prepare by doing even more hill training. I will most likely do another 50K if for no other reason than to see if I can finish in my expected 6 hour time period. Big thanks again to the staff and volunteers at Inside Trail Racing for putting a well run trail race. Here is a followup where I improved my time by 1 1/2 hours and still came in last in my AG! Link. Saved $10 using Cyber Monday discount code 'CYBMON13' and signed up to do Folsom 50K again Saturday, April 26, 2014! Can't wait.